Recognised as one of the world’s best and most charismatic viola players, Maxim Rysanov is the winner of the prestigious 2008 Classic FM Gramophone Young Artist of the Year. Additional awards include the Tertis and Geneva competitions as well as the 2007 BBC New Generation artist scheme. Originally from the Ukraine, Maxim is now based in London. 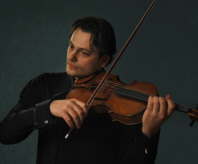 He is regularly invited to perform as a soloist and chamber musician in the UK and abroad and has been a guest of many festivals and venues worldwide. He performs with symphony and chamber orchestras throughout the UK and is a frequent soloist abroad including invitations from the European Union Youth Orchestra, Residentie Orkest, Amsterdam Sinfonietta, Orchestre Royale de Chambre de Wallonie, China National Philharmonic, Guangzhou Symphony, Bayerischer Rundfunk Kammerorchester, Deutsche Staatsphilharmonie, Geneva Chamber Orchestra, Basel Sinfonie Orchester, Mostly Mozart Festival Orchestra, Grand Teton Festival Orchestra, Sinfonia Varsovia and the Lithuanian National Symphony Orchestra among others. He works with artists such as Leif Ove Andsnes, Jirí Belohlávek, Augustin Dumay, Martin Frost, Janine Jansen, Gidon Kremer, Mischa Maisky, Viktoria Mullova, Donald Runnicles and Maxim Vengerov. Highlights of the 2008-09 season included concertos with a clutch of BBC orchestras including the BBC Symphony (Schnittke), the BBC Philharmonic (Hindemith), the BBC National Orchestra of Wales (Martinu), as well as a tour with the Britten Sinfonia (Britten and Woolrich) and the Bournemouth Symphony Orchestra and Sinaisky (Berlioz). Outside the UK, he will make his debuts with the Residentie Orkest and Neeme Jarvi (Britten and Kancheli Double Concertos with Janine Jansen), the Sinfonia Varsovia (Mozart Sinfonie Concertante with August Dumay), and the Schleswig Holstein Orchester and Mihkal Kutson (Kancheli Styx). He will perform the Tchaikovsky Rococo Variations with the Cape Town Philharmonic, the Belgrade Philharmonic, and the Lithuanian National Symphony among others. In addition, he made his US concerto debut at the Mostly Mozart Festival in New York (with Jiri Belohlavek) and at the Grand Teton Festival (with Donald Runnicles). He has been invited back to Grand Teton in 2010 for a performance of Kancheli Styx. Maxim’s interest in new music is strong. The BBC commissioned Dobrinka Tabakova to write a new work for him – A Jazz Suite – and Concertos dedicated to him include works by Tabakova, Artyom Vassiliev and Elena Langer. Maxim also has a burgeoning career as a conductor. This season he has a re-invitation to the Basel Sinfonie Orchester and will conduct the Swedish premiere of a cello concerto by Dobrinka Tabakova with Kristine Blaumane and the Dala Sinfonietta. Maxim plays a Giuseppe Guadagnini (1780) viola on extended loan from the Elise Mathilde Foundation.